In this issue of Rouleur : “I was always dreaming of the Classics.” Now Quick Step’s star wins them instead. Ned Boulting heads to Monaco to meet Philippe Gilbert, the thrilling bike racer who is enjoying an Indian summer. Paul Maunder heads to church with a difference in Flanders to look at the complex relationship between cycling and religion. A breath of fresh air: we go mountain trekking with Mitchelton-Scott veteran Svein Tuft, “the complete opposite of what you expect a professional cyclist to be.” Also featuring: a tour of forgotten Classics finish lines, Tour of Iran in photos, riding shotgun with commissaire Guy Dobbelaere at the Dauphiné and beautiful bikes from the Rouleur Classic. Plus columnists Matt Seaton, Philippa York and Hennie Kuiper. 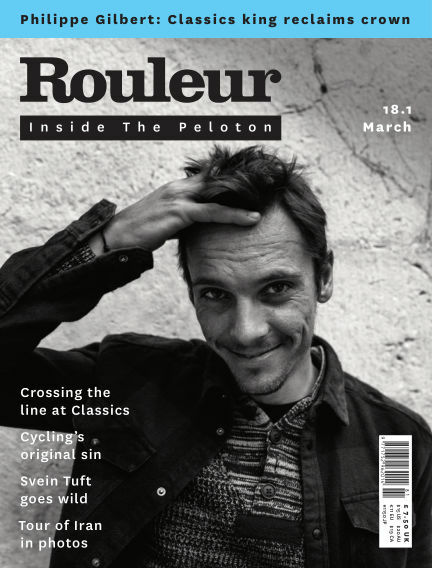 With Readly you can read Rouleur (issue 18.1) and thousands of other magazines on your tablet and smartphone. Get access to all with just one subscription. New releases and back issues – all included.